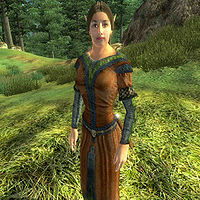 Faurinthil is a Bosmer commoner who is a devout worshipper of the Daedric prince Sanguine, and can be found with her fellow worshippers at the Shrine of Sanguine. She spends her entire existence reveling in the glory of Sanguine, without ever eating or sleeping. Instead, she spends the majority of her time seated on one of the benches, listening to the sermons held by Ashni. Otherwise, she just strolls around the clearing. In combat, she relies on an iron dagger. She wears a russet felt outfit with matching shoes. She only carries a small amount of gold. When you approach her, she will give you a brief explanation as to why she chose to worship a Daedric prince whose sphere is hedonistic revelry, debauchery, and passionate indulgences of darker natures: "It all feels good. It's all fun. Why not?"